President Bush offered encouragement to war-weary Iraqis on Monday but acknowledged they have paid a heavy price — 30,000 dead — as a result of the U.S.-led war and its bloody aftermath. As Iraqis began voting in parliamentary elections, Mr. Bush said that no country has formed a democracy without "challenges, setbacks and false starts." He cautioned that the elections "won't be perfect." "There's still a lot of difficult work to be done in Iraq," the president said, "but thanks to the courage of the Iraqi people, the year 2005 will be recorded as a turning point in the history of Iraq, the history of the Middle East and the history of freedom." "I would say 30,000 more or less have died as a result of the initial incursion and the ongoing violence against Iraqis," the president said. "We've lost about 2,140 of our own troops in Iraq." As a matter of policy, the White House has never commented on the Iraqi death toll since the U.S.-led invasion. So it came as a surprise when President Bush offered a number, CBS News correspondent Mark Knoller reports. White House spokesman Scott McClellan said later that there was no official U.S. estimate of Iraqi deaths and that Mr. Bush was citing media estimates. Another questioner challenged the administration's linkage of the Sept. 11, 2001, terrorist attacks with the Iraq war. 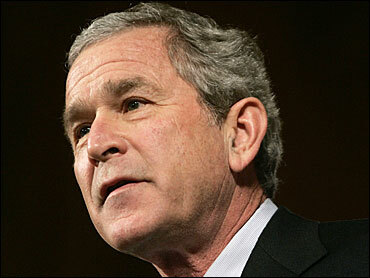 Mr. Bush said that Saddam Hussein was a threat and he was believed to have weapons of mass destruction. "I made a tough decision," Mr. Bush said. "And knowing what I know today I'd make the decision again. Removing Saddam Hussein makes this world a better place and America a safer country." The speech was the president's third on Iraq in recent weeks as he tries to revive public support for the U.S. mission. The final address in the series is planned for Wednesday in Washington. CBS News correspondent Susan Roberts reports that shortly after the president's speech, one of his most vocal critics repeated his message: American forces are no longer welcome in Iraq. "First they saw us as liberators, now they think we're occupiers. They want us out," said Rep. John Murtha, D-Pa.
Other Democrats said Mr. Bush's speech fell short. "I regret that the American people have still not received a plan that identifies the remaining political, military and economic objectives that must be met in order to succeed," Senate Democratic leader Harry Reid, D-Nev., said. Mr. Bush said he came to Philadelphia to speak about democracy in Iraq because this city was the birthplace of the U.S. Constitution. "The past two and a half years have been a period of difficult struggle in Iraq, yet they have also been a time of great hope and achievement for the Iraqi people," Mr. Bush said. "Just over two and a half years ago, Iraq was in the grip of a cruel dictator who had invaded his neighbors, sponsored terrorists, pursued and used weapons of mass destruction, murdered his own people and, for more than a decade, defied the demands of the United Nations and the civilized world. "Since then, the Iraqi people have assumed sovereignty over their country, held free elections, drafted a democratic constitution and approved that constitution in a nationwide referendum." Mr. Bush has seen his approval rating rise 5 points since October, to 40 percent, according to a CBS News/New York Times Poll last week, but most continue to say the war in Iraq is going badly. "Speeches by the president have been helpful," Sen. Lindsey Graham, R-S.C., a critic of the administration's handling of Iraq policy, said on NBC's "Meet the Press." "They have been long overdue."